Join us for an all-inclusive Larp vacation where you stay in a modern hotel for 4 days 3 nights and enjoy a historical, picturesque castle to attempt thrilling quests and adventures, whiling making new friends from all over the world. Enter a fantastical, magical challenge where you will use your gift of magic to defeat exotic beasts and locate and save curiosities around the world that have been released by the dark magic of The Cursed Castle! 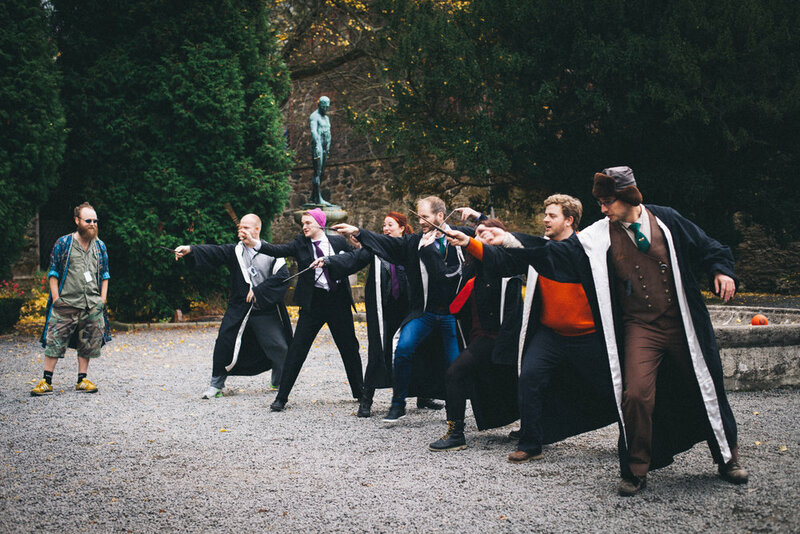 Live out your dream of being an Agent of Wizardry in an all-inclusive immersive Larp and gaming adventure within an American Castle! You will be first cast into a secret magical circle and then can be recruited into a powerful and influential wizardry faction to race against time to solve the curse of Grey Towers! Ticket purchases and Lump installment payments are non-refundable. This is because this event has a budget and strict production schedule. The producers rely heavily on each and every ticket purchased and immediately invest the funds into the event production schedule. Cancelled orders and refunds could result in harming the production and the promises we are making to everyone who plans to attend. These events take a lot of work, time and money (more than most people realize) to make the magic happen. So, please understand this is why there are no refunds. You can transfer your ticket to another person, just email us if you do so. Thank you for understanding! Here are a few practical details about the event. Note: we will be releasing a lot more information over the coming weeks, such as the schedule, secret Magical Factions, design details and light rules and more! Grey Towers is a short Uber or Lyft ride to and from the Philadelphia International Airport and the main Philadelphia train and bus station. Hotel check-in is at 3:00 pm Thursday January 3rd, the event will end in the afternoon on Sunday January 6th. If you wish to book the hotel for Sunday night post-game please do so with the hotel directly. Once you arrive at the hotel everything is taken care of for you for the remaining four days until the conclusion of the adventure on Sunday. Welcome to your glimpse into a magical world! Never got your owl? Well, this is your chance to have the complete wizarding education experience, just as an adult! Come join us for a 75 minute journey filled with magical classes and brilliant professors, buzzy concoctions and tasty treats, and of course some healthy house rivalry - all in a delightfully immersive environment designed to transport you into a magical world. Try your hand in the art of potion making. Identify the many magical plants used for remedies and concoctions. Lead your house to victory and win the cup! Your experience will include three classes, each with their own unique cocktails, that will guide your journey to becoming the best wizard or witch! the advance school of wizardry will be back in session in 2019! Please sign up for notification of future school dates!